For music on the go, check out this "Stereo Sound System" by Bohsei. Circa 1970-1980, the full stereo system is included in a nondescript briefcase. 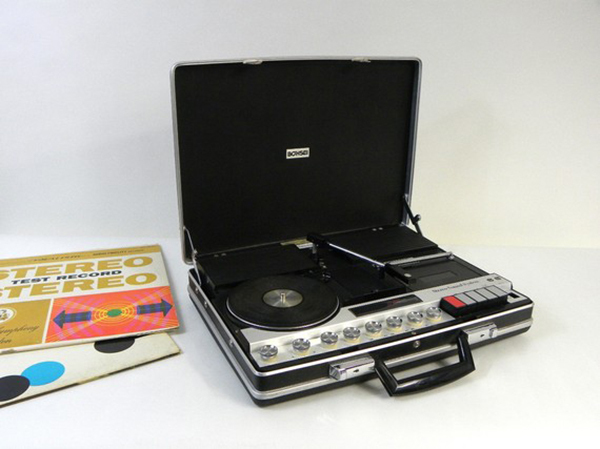 The piece is outfitted with a 3-speed turntable (with a 45 record adapter), removable speakers, AM/FM stereo with a rod antenna, and cassette tape player/recorder. It also comes with two microphones, AC connector, and a "Beat Cut" switch, Main switch knob, Speed knob, Program knob, Band knob, Tuning knob, and Tone, Volume Left and Volume Right knobs. 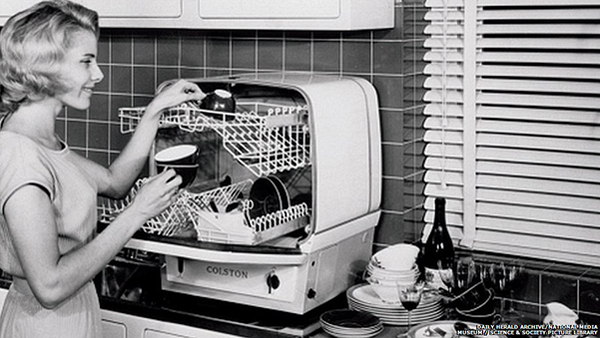 This 1950s Colston dishwasher appears to be little bigger than a breadbox, and perfect for apartment living. Please, someone, bring it back! 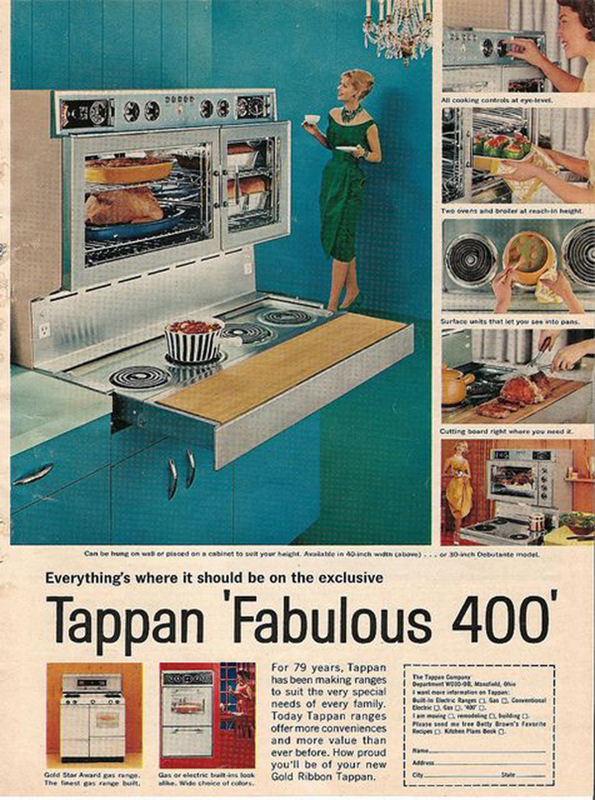 The 50s were all about modern conveniences, and in 1959, appliance giant Tappan reimagined the stove, and came up with the ground-breaking Fabulous 400. Instead of the conventional low single oven that required stooping down to cook or clean, the 400 featured dual ovens located at eye level, both lined with gleaming stainless steel and fitted with full glass doors. The smaller oven had an electric rotisserie motor fitted at the rear. Burners were installed in a slide-out drawer, complete with fold-down maple cutting board. The 400 could be built-in, but was most commonly installed on its own matching lower storage base cabinet. Another kitchen appliance perfect for apartment living is this ElectroChef combo refrigerator and stove. What the ElectroChef lacks in space it makes up for in weight – it's a whopping 500 pounds! This vintage tv/phone combo was ahead of its time – too far ahead as it never really got out of the prototype stage. 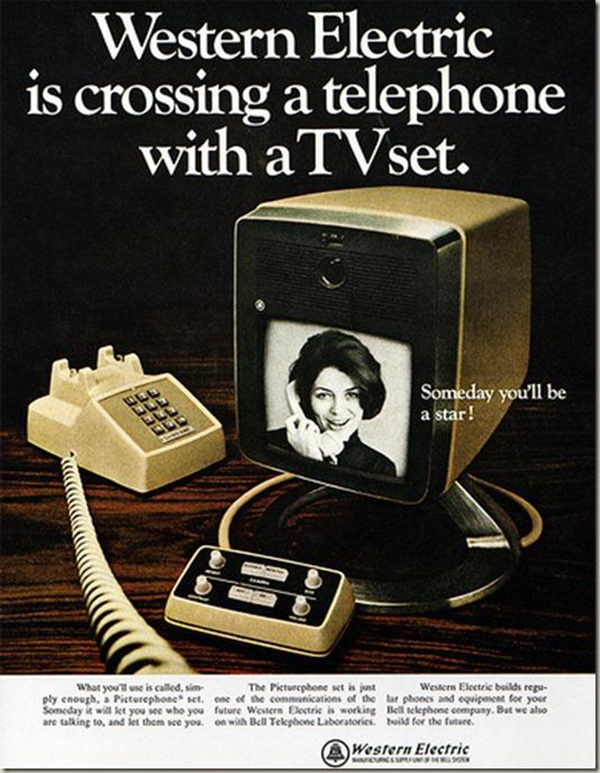 Clunky, expensive, and uncomfortably intrusive, this kind of communication didn't really take off until the 21st century, but we've got to give Western Electric (and other videophone creators) kudos for leading the way. We LOVE this mid-century combination television/record player/mini bar. 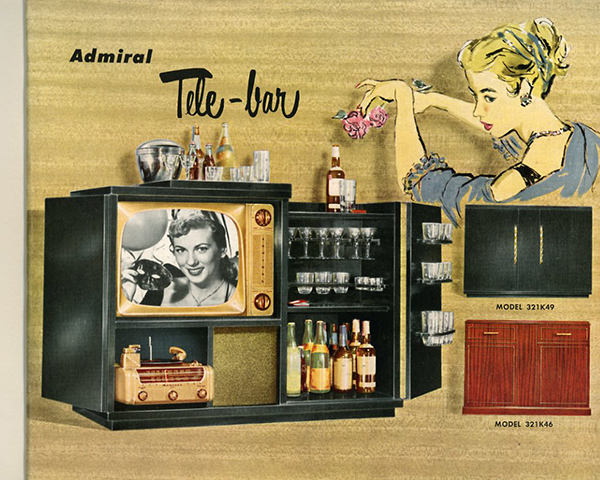 It was described by Admiral in their advertisments as "the one and only Tele-Bar…. 21? TV, Dynamagic Radio, and the incomparable “Triple-Play” Phonograph… with A Built-In Bar it's Fully Equipped! Its exquisite, hand-rubbed, liquor-proof cabinet provides a stainless steel mixing tray, liquor-proof serving shelf, 'empties' receptacle, and racks for 32 glasses. Lower compartment holds over 30 bottles. For those who entertain regularly…Tele-Bar is an indispensable aid and a practical investment. Glasses included at no extra charge." 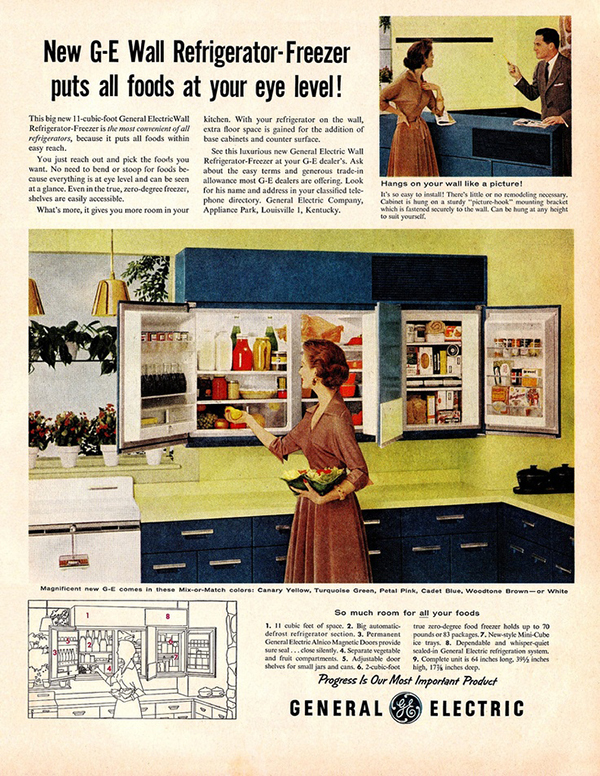 A refrigerator hidden in the cabinetry? 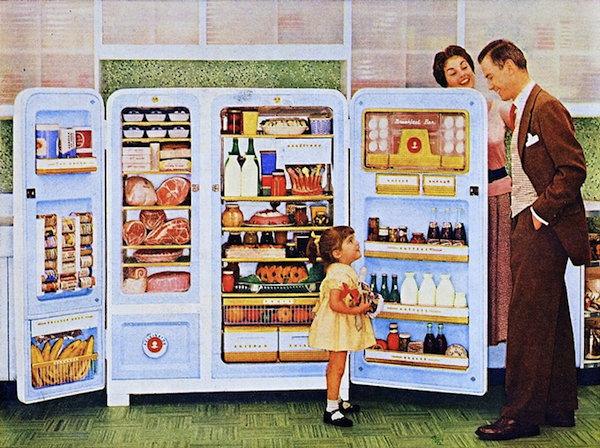 The GE wall refrigerator-freezer of 1955 was just that. 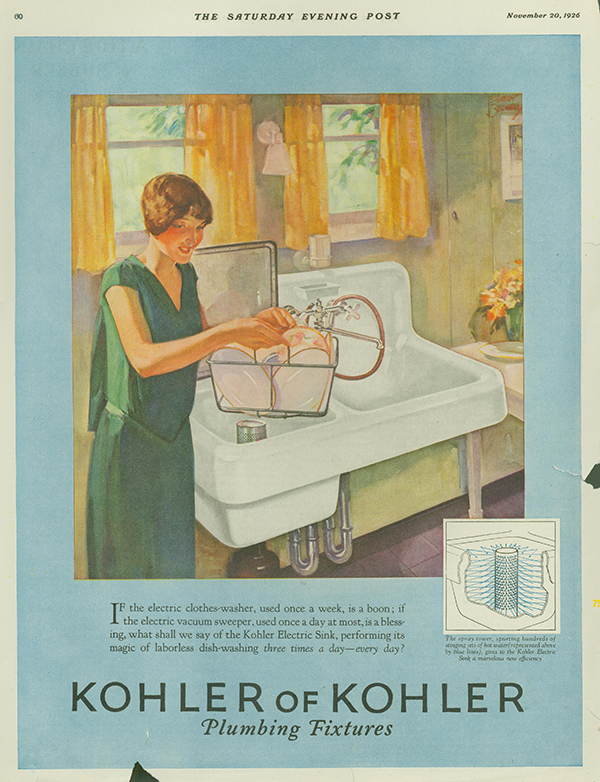 Once again, for small space living, we wonder why the electric sink wasn't very popular, although it is a precursor to the modern day dishwasher. 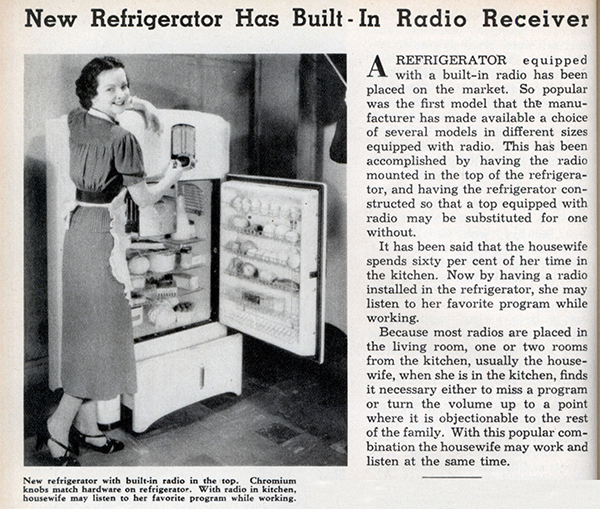 While it wasn't the worst idea, simply placing a radio in the kitchen would likely have been a cheaper solution than buying the above combo, especially during the height of the Great Depression. 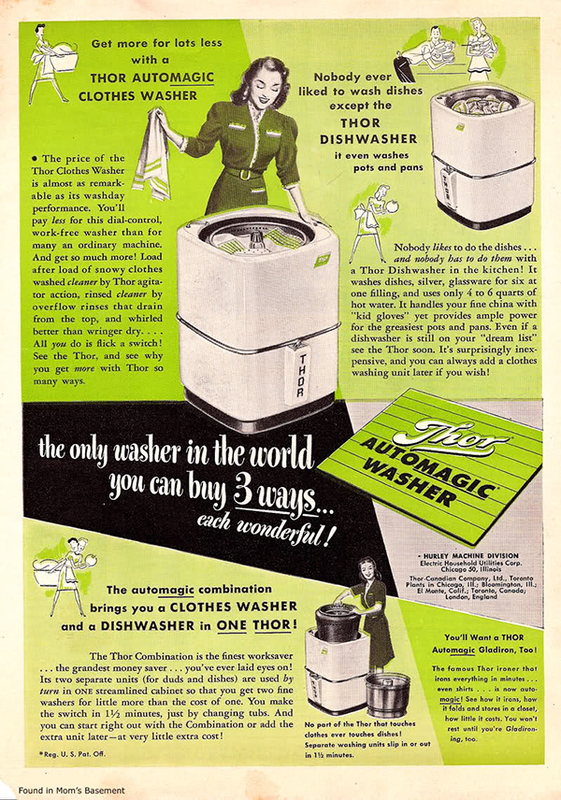 In 1907, Thor introduced the first electric clothes washer sold commercially in the United States and were appliance innovators throughout the 20th century. 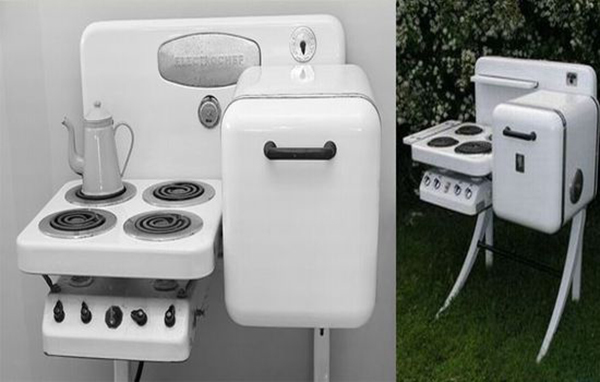 They also introduced a combo washing machine and dishwasher in the 1940s. Despite pretty major marketing at the time, the machines didn't do too well – most consumers were put off by washing their clothes and dishes in the same machine.